What is this website all about? What are covers? Covers are songs that are already famous performed by other singers and/or musicians than the original artist who made them well-known. Performing songs they love has become a passion for some and you can enjoy the best of those performers from around the world here. Reading this FAQ and our quick Site Guide will give you a good idea what all you can do here and how to enjoy the site. What are the little circle graphs I see on many videos? This tells you that the video has a Top10Covers Review. A full orange circle is a 100/100 review score and the number inside is the score out of 100. You'll notice lots of high scores, like the 82 in the sample image. That's because every cover performer video you see on here is high quality (that's why we're named Top10Covers) but click to see the video and the full review where you'll see the performance ranked across five criteria. Can I rank the videos? Yes you can and we hope you will tell us your opinion. To vote just mouse over the stars on the box (shown below) and then click on the number of stars you want to give (1-5). Note that only one vote per visitor is permitted in our system so pick your rating wisely. For more information on reviews/ratings see our Top10Covers Ratings Description. What are the star bars I see on some videos? We don't review videos featuring what we call "famous" artists, but our site visitors can. Those videos have a star bar on their homepage image like the one on the left instead of a circle graph. How are your Top 10 lists determined? When we developed the idea for this website, we wanted to spotlight new amazing artists and that is our main focus. However, we also wanted people to be able to see and hear well-known, famous artists doing covers that helped them along in their careers. What we call "famous" are artists such as Justin Bieber, Alessia Cara, Ariana Grande, Karmin, Lady Gaga, Ed Sheeran, Pentatonix, etc. Today's Top 10: New Artists are the most-viewed covers from the last 24 hours by new (or not yet very well-known) artists. Today's Top 10: Famous Artists are the most-viewed covers from the last 24 hours by already famous artists. How about the Top 10 category lists (guitar, drums, rock, pop, 2000s, 1980s, etc.)? When you use the "Category" button to search by instrument, genre or year you have two choices. You can use the "all" menu button (like "All Guitar") and you will see all performers, famous or not, in no particular order. When you pick the Top 10 menu button (like "Top 10 Guitar"), you'll get the Top 10 of that category ranked by all-time most views at our site, and these lists will exclude famous artists. The only exception to this is when you select Top 10 Vocal, you'll get all including famous artists. How do I find covers of my favorite artists songs? Just type the artist's name into the top search bar. If you want to see all artists featured on the site, just click the Artists menu button and mouse over the original artists tab. Then click any artist and you'll see all the covers of that artist's songs. You can also use the Artists A-Z list on the bottom right. How do I find covers from my favorite cover performer? Just type their name into the top search bar. 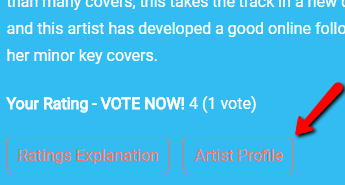 If you want to see all cover performers on the site, click the Artists menu button and mouse over the cover performers tab. Then click any performer and you'll see all their covers featured on the site. You can also use the Artists A-Z list on the bottom right. Hey, someone like Ed Sheeran starting out by doing covers, and now people are covering his original songs. Isn't he both a cover performer and an original artist? Yep, and in those cases you'll see them on both tabs/lists. For example, as a cover performer you'll see an asterisk their name (Ed Sheeran*). As an original artist (i.e. for covers of Sheeran's songs) you'll no asterisk next to their name (Ed Sheeran). I want to see all your "famous" artist cover videos--how do I do that? Besides checking out the Today's Top 10: Famous Artists ranking on the home page, click on the Famous menu button to see them all, in random order. What will I find under the Cool Stuff button? Amazing Kids A sample is this six year-old drummer who really, truly rocks. For the purposes of our site, we typically include performers who are 14 years-old or younger in this category. Collaborations Performers from different places, including all across the world at times, who work together virtually to create a cover performance video of them all together, sometimes called "virtual bands." Famous Meets Amateur For example, Ed Sheeran surprising a girl performing one of his songs in a shopping mall by joining her on the mic. Medleys Creative presentations of a mixture of songs, including medleys like 22 TV themes in 7 minutes, or a 65 rock song chronology in 5 minutes and also mashups like this one of Charlie Puth/Ellie Goulding/Maroon 5 songs. Street Performers such as this guitarist in a historic square with his awesome take on Queen classic "Bohemian Rhapsody." Unique stuff like five people playing one guitar and singing Gotye's "Somebody That I Used To Know." Seen that one? Then check out a guy on dulcimer playing Tears For Fears "Everybody Wants To Rule The World" (oh, and having Tears For Fears' lead singer show up to join him). I know of an amazing cover you should have on your site--can I suggest it to you? Sure, we love that--but it really does have to be amazing and not just your nephew who you love, no matter how bad their performance really is! Also, be sure they are covering a relatively well-known song. Just send us a note by filling out this form with a brief description of what the track is and where it can be found. For example just tell us something like: "Search artist name ________ and song title _________ on YouTube™" Please do not send us live YouTube website links. Keep in mind that we only feature material that, in our sole editorial opinion, warrants inclusion. Finally, note that we do not currently include material hosted on websites other than YouTube. Can you connect me with an artist? I'm interested in them and their music. Some of the artists featured on our site have established an Artist Profile. You can find a button to access it at the bottom of a Top10Covers Review as shown on the image at the right. If no button appears, there is no profile available on that artist. Profiles provide an artist bio, images, more music from them and so on. Note that none of the artists featured on our site have any affiliation with us so we have no other contact information for them. The information provided in Artist Profiles is controlled by the artists themselves or their representatives. NOTE: Artists interested in establishing an artist profile on the site to help promote inform people worldwide abut themselves can learn more about Artist Membership options (including free Basic Artist Membership) here. Can I get digital video or audio files of a video? Since we do not own any of this material on our site we cannot provide any files. The music content resides on third party sites. We find it and enable you to stream it in a YouTube-authorized video player. We should add that we follow all third party site user agreements and only post links that we are authorized to post here. We do not support "ripping" or any illegal use of these tracks, or any artist content. We encourage everyone to support artists by buying their music and/or contacting them and associated content rights holders to arrange usage. What is a Top10Covers.com Artist Membership? What is the benefit to me as an artist (or their representative)? Artists Members gain the opportunity to provide site visitors with an artist profile and other information. This can include a bio of the artist, more info on their music, how fans can purchase their music, see their other music videos, see them in live performance, etc. You can find full details on the benefits of joining here. How much does Artist Membership cost? Basic memberships are free, while Pro and Pro Plus level membership plans providing more promotion and other benefits are available for nominal monthly fees. Do Top10Covers.com Artist Members get more videos featured on the site than anyone else? No. No membership at any level includes any guarantees that the member's music videos will appear on the site. All videos you see on this site are featured here because the site's editors feel they are exceptional, special and/or unique performances worthy of appearing on the site. There is no "pay for play" here unlike certain other cover performer sites you will find on the web, who also entice their free members with benefits so that they will view and rate other artist's videos. Here, performances by our featured artists get real views and exposure to real music fans, not just to artists trying to make it. Can anyone besides artists join? Artist Memberships are designed only for artists or those who they authorize who are working for them (artist managers, publicists, fan club representatives, etc.) You can find full details here. How do I view/listen to a video? Just click on the play button in the middle to view/listen right here on our site just as you would on YouTube. You can pause or stop it anytime using the controls on the bottom. I've pushed play on a video and can't hear anything--what's up? Check the volume control on the video clip player to make sure it is not "x'd" out or muted, or has the volume slider turned down. I am seeing ads on some of the videos. Can I shut those off? Also, is top10covers.com making money off those ads? If you see ads, you can just ignore them or click the small "x" to make them go away. These ads are not placed by our website and we derive no revenue from them. The ads are placed on some videos by YouTube in order to generate revenue for their company. They in turn share a portion of this revenue with the owners of the content in the video, based on the number of plays a video receives and other factors. Thus, some of these videos are generating revenue for the cover performers you see, the song publishing owners, or both. I tried to view a video on my mobile device that worked on my desktop/laptop, but it won't play on my phone/tablet. What do I do? Some sites such as YouTube have started to restrict mobile device viewing of some videos. The best is to just view those videos on desktop devices. I found a video that is not working. Should I let you know? This does happen at times and yes, please do let us know. Just click here to jot a note to us. Tell us the missing/broken video's artist and song title. We appreciate it!